Here we are at the western end of American Samoa. We had assumed it was the most westerly point in the U.S., but that title belongs up in Alaska. However, while technically that northern extremity is 172 degrees west and American Samoa is only 170 degrees west, the degrees are a lot longer here near the equator than up there near the poles. Thus while this isn’t the furthest west you can get in the U.S., it is the furthest you can get from the Prime Meridian that runs through Greenwich, England. So there. 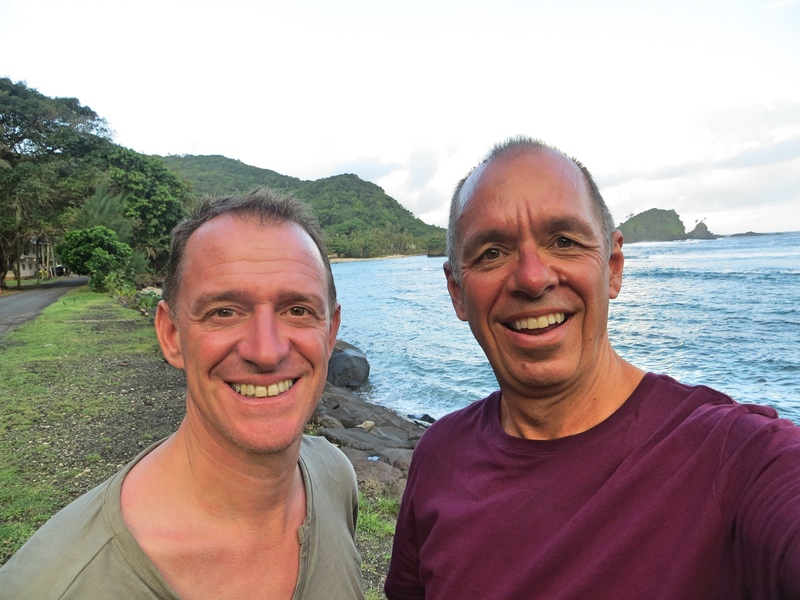 We expect to spend the next six weeks or so in the South Pacific, a part of the world we’ve never been to before, and we’re starting in American Samoa. It’s a short stop – just a day-and-a-half – but then it’s a small place. Consisting of five main islands, American Samoa covers less than 77 square miles. To put that in some context, Washington, D.C., is slightly over 68 square miles. So it’s small, with a population of about 55,000. How did this tiny group of islands become an American territory? I know that we acquired a bunch of territories as a result of the Spanish-American War in 1898 (e.g., Cuba, Puerto Rico, Guam, the Philippines), so I wondered if that’s where American Samoa came from, too. Nope. The Samoan islands, including American Samoa and today’s independent country of Samoa, were important Pacific refueling stations in the 19th century; the harbor at Pago Pago (pronounced something like pongo pongo and crucial for solving many crossword puzzles) was particularly attractive and used by Germans, French, British, and American ships. The Germans and Americans got into a fight over the islands in 1889 but, before either side could score a victory, a typhoon wiped out both sides’ warships. Ultimately the issues were settled by the 1899 Tripartite Convention, whereby the U.S. acquired the eastern Samoan islands (smaller than the western islands but home to Pago Pago), the Germans took the western islands, and the British got Tonga, parts of the Solomon Islands, and some territory in West Africa. It does not appear the locals had much say in any of that. 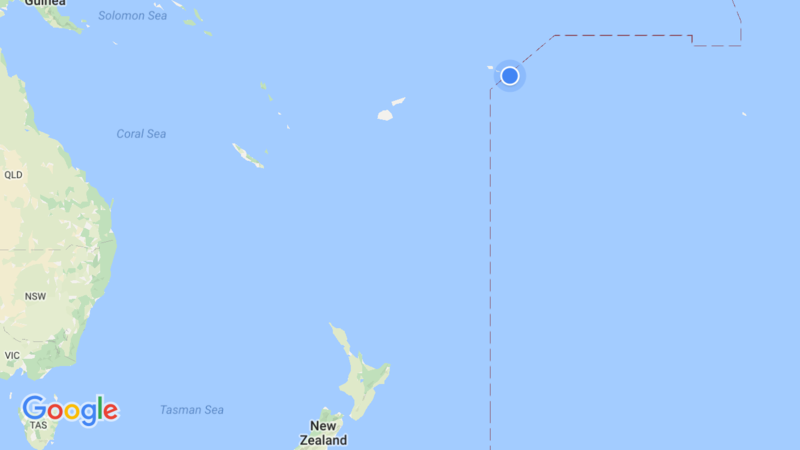 If you’re wondering just where we were, that blue dot is American Samoa. The dashed line is the International Date Line, so you get a sense of just how close we were to tomorrow. Today the American footprint here seems relatively limited. They use the U.S. dollar as currency and people are pretty much fluent in both English and Samoan. At the same time it is a self-governing territory with little actual role for U.S. officials. American Samoans can live and work in the U.S., but citizenship is an interesting issue. American Samoans are U.S. nationals, but not necessarily citizens. Confused? It turns out that all U.S. citizens are U.S. nationals, but nationals are not necessarily citizens; people born in American Samoa are not U.S. citizens unless one of their parents was also an American citizen. In other U.S. territories – Guam, Puerto Rico, and the U.S. Virgin Islands – newborns are automatically U.S. citizens; American Samoa is the outlier in this case. Even so, the system seems to work. One piece of evidence of the relative support Samoans give to their relationship to the U.S. is that American Samoa has the highest rate of military enlistment of any state or territory. Of course, part of that is a function of the relative poverty here compared to the rest of the U.S., but the economy is comparatively strong; per capita GDP is about $13,000 here compared to a bit under $5,500 in neighboring Samoa. Tuna processing is the main industry, with roughly half of private sector workers helping to ensure that American kids never have to go without their tunafish sandwiches. One thing American Samoa is not, though, is a tourist destination. We’ve probably never been anywhere with less of a tourist infrastructure. We stayed at a reasonably nice hotel on the coast, but it’s the kind of place with no web site or anything like that. Everyone we met there over breakfast was there for work, whether with the VA, the Coast Guard, or whatever. As we went through immigration (it’s part of the U.S., but we needed to show passports to get in) and so on, people seemed genuinely surprised when we said we were just there to visit. So no resort hotels, no fancy restaurants, no great swimming beaches, just a couple days in a tropical island. Our hotel was modest, but it was right on the coast (actually, pretty much everything in America Samoa is right on the coast). 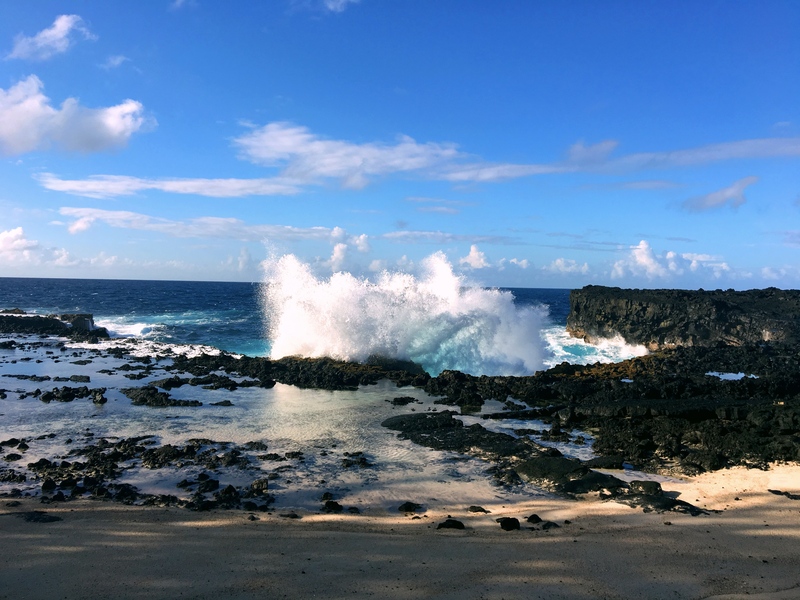 It’s a rocky coast with lots of steep cliffs, so there was some great crashing wave action. Made for a pretty glorious place to sit and read and watch the ocean move. Our stay was short in part because of a truly weird phenomenon. A month or two ago, when we decided to come this way, we made reservations both in American Samoa and in Samoa. We would stay in American Samoa for three nights, September 12-14, and then on the 15th go to Samoa. When we went to reserve our flight between the islands, though, we discovered that to get to Samoa on the 15th, we had to leave American Samoa on the 14th. You see, although it’s only a 35-minute flight, and you don’t even cross a time zone, you do cross the International Date Line. So you leave Pago Pago at 10:45 AM on Wednesday, September 14, and arrive in Apia, Samoa, at 11:20 on Thursday, September 15. And since our reservation in Samoa was non-cancelable while the reservation in American Samoa was cancelable, we had to knock one night off our already brief stop there. That’s too bad, because I would have like a little more time. As I said, it’s a really small place, and over the course of our one full day there we drove from one end of the main island to the other and it seemed kind of interesting. There was, for instance, a church in every tiny little village we drove through. Sad, to me, that the poorer people are the more they seem to spend on churches. And there were some distinctly unique things to observe. Like kids all outside playing volleyball and even cricket, but no soccer that we saw. I thought kids everywhere in the world (except mainland USA) played soccer. And the tombs in front yards. As we drove through these tiny villages, many houses (most?) had big burial plots in front, presumably for dead ancestors. It seems nice to keep them so close, but it occurred to me that such a quirky tradition might have some significant impact on a house’s resale value. (“Um, are they going with you?”) Just driving in American Samoa was interesting; the entire island seems to be posted at 25 miles per hour, except where it’s posted at 20 miles per hour. And people really, really drive that slowly. Weird. So that was it, one of the more remote and isolated places we’ll ever go to. If you ever go, there was one decent restaurant and our hotel had it’s charms, but don’t expect a lot. A great place to start a South Pacific adventure, though.